In October 2009, we ran an article about the growing field of animal cognition and highlighted a research project on vervet monkeys. It appears that vervet monkeys have the ability to differentiate their calls to signify the presence of various kinds of predators. For instance, the call for "’Leopard!’ does not sound the same as ‘snake!’ or ‘eagle!’" In the same way, it appears that prairie dogs communicate with each other to differentiate predators or objects in their surroundings, and professor Con Slobodchikoff of Northern Arizona University is on the forefront of "prairiedogese" interpretation. A few months ago, NPR aired a story about Con Slobodchikoff during its program Morning Edition, highlighting his research on the various calls and alarms of the prairie dogs. "When Slobodchikoff first started studying the prairie dogs, he couldn’t really tell the difference between the calls for, say, a coyote or a hawk. But the prairie dogs responded to the different calls with specific behaviors, like dropping into their burrows or standing up to get a better view. Slobodchikoff started to think there might be something in those "chees" that he wasn’t hearing." 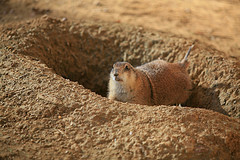 Through recording the calls prairie dogs made in response to predators—a hawk or human or coyote, for example—and then analyzing the call’s layers of frequencies in a computer lab, Slobodchikoff discovered that the calls were grouped together into frequency clusters, with obvious differences between a general warning call or an alarm about a domestic dog versus a coyote. This in itself spurred more inquiry—why is the prairie dog call for "human!" consistently different than the others, and is there a possibility that prairie dogs are distinguishing between different humans? "He began to wonder whether the little rodents could possibly be describing their predators — not just differentiating hawk from human, but actually saying something about the particular human or coyote or hawk that was approaching." His test for this was quite simple, actually. He dressed four humans in four different colored shirts—blue, yellow, green, grey—and had them walk through the prairie dog village four times. After recording the warning calls and then analyzing them, Slobodchikoff found that the calls organized themselves based on the color of the human’s shirt. Amazingly enough, the calls even differentiated between other factors like height—"’Essentially they were saying, ‘Here comes the tall human in the blue,’ versus, ‘Here comes the short human in the yellow.’"
While Slobodchikoff’s research lends clues into social animal behavior, it still leaves many questions about animal cognition and language within prairie dog communities. The prairie dogs are talking, and now we finally have a bit of a way to crack into their language.